NEW ORLEANS – The USTFCCCA Convention is set to return to the JW Marriott Desert Ridge Resort & Spa for the first time since 2014. This year’s installment will be held at the gorgeous property in Phoenix, Arizona, from December 12-15. Rooms for Convention-goers are available at both the JW Marriott Desert Ridge Resort & Spa and the neighboring Residence Inn Phoenix Desert View. 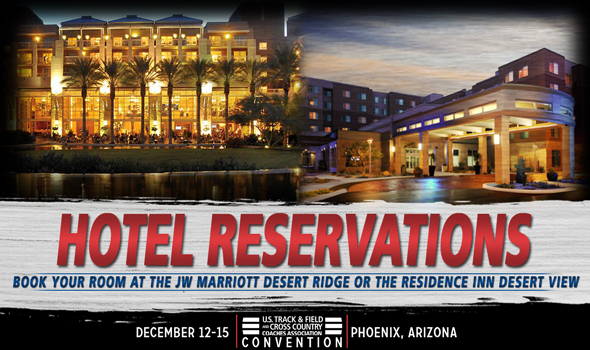 If you’re arriving to the USTFCCCA Convention between Tuesday, December 12 and Thursday, December 14, there is a three-night minimum stay required at the JW Marriott Desert Ridge Resort & Spa. But if you’re arriving between those dates and don’t wish to stay for a minimum of three nights, book a room at the Residence Inn Phoenix Desert View. Both hotels are offering registered Convention-goers a rate of $137 per night (plus taxes) and it’s available from Saturday, December 9 through Monday, December 18. Please note that hotel rates are separate from the cost of registering for the USTFCCCA Convention. Attendees are responsible for making their own reservations. If you need to find a roommate, be sure to check out the Roommate Finder. Coaches staying at the JW Marriott Desert Ridge Resort & Spa have access to five pools, two whirlpools and a Lazy River. Three of those pools are heated to 82 degrees year-round. You can also find the acclaimed Wildfire Golf Club on the grounds of the JW Marriott Desert Ridge Resort & Spa and that’s where the annual USTFCCCA Golf Scramble will be held on Tuesday, December 12. Players will either tee up on the Faldo Championship Course or the Palmer Signature Course. There is a $95 entry fee to play in the Golf Scramble and it includes tournament entry, a shared cart and range balls. For more information about the JW Marriott Desert Ridge Resort & Spa and/or the USTFCCCA Convention, be sure to visit the USTFCCCA Convention website.